Chuck Lichon, R.S., M.P.H., Deputy Health Officer at District Health Department #2 in Michigan, developed a Children’s Environmental Health Power Point Program with the financial assistance of the Dow Chemical Company, Midland, MI. The Power Points are approximately 25-35 minutes in length, allowing for a presentation to be made during one classroom setting, or to be used for a community presentation, allowing time for Q & A. Some of the topics include: Sunwise, Body Art, Household Hazardous Waste, Meth, Recreational Water, and more. The ecological study described in this article assessed morbidity and mortality excesses in the eight municipalities surrounding the municipal solid waste landfill of Barengo (Novara, northwest Italy). The resident populations living in this area on December 31, 1991, and December 31, 2005, were assessed. Standardized incidence and mortality ratios were calculated using data from hospital discharge forms, death forms, and regional databases. For congenital malformations (2003–2009 period), incidence excesses were found in females. This article characterizes the patterns of environmental health literature from 1993 to 2012 by using bibliometric techniques based on databases of the Science Citation Index and the Social Science Citation Index. “Research article” was the most widely used document type, accounting for 71.7% of the total records (5,053), and 94.9% of these articles were published in English. The number of environmental health publications is growing along with an increasing level of communication. 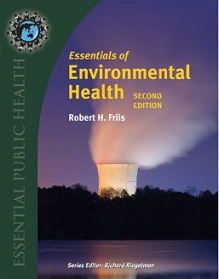 The U.S.
Essentials of Environmental Health (Second Edition) provides a clear and comprehensive study of the major topics in environmental health. What type of consumer products do you interact with on a daily basis and do they contain nano-particles? What properties might those engineered iron, titanium and carbon nano-particles exhibit that differ from the norm? What type of information do environmental health professionals need to prevent exposures that might cause negative biological effects? This session will give you the facts so you can adapt to the rapidly changing intersection of health and environment. Geochemical Correlates to Type 1 Diabetes Incidence in Southeast Sweden: An Environmental Impact? Read more about Geochemical Correlates to Type 1 Diabetes Incidence in Southeast Sweden: An Environmental Impact?